I’m strapped to a chair. I have lost the will to fight anymore. Deprived of food, water, sleep and any form of entertainment or interaction with any living creature, I was no longer able to fend them off. I barely came to, and now I have no idea what will happen next. That’s when the torture began. The jelly beans slowly marched into the room through a tiny rat hole, one by one. They ambled over to me and began to chew at my ankles, savoring my many flavors. Or single flavor. I never chewed on my ankles before, so I’m not sure. I was too weak to stop them. That’s when I realized something. JELLY BEANS ARE FOOD! I AM SO STUPID! I feigned strength, hoping that I could hold on long enough for my plan to work. I pretended that they were not hurting me. They began to travel all over my body, searcing for my weak point. When one crawled into my mouth and had a nibble, I screamed my best painful scream. Anxious to finish me off, they all crawled into my mouth. However, before they ate my tounge, I DECIDED TO EAT THEM INSTEAD! YUMMY AND FREEDOM ARE AWESOME! I waited for my surge of power that would see me break through my bonds and rip everything in half. Then I realized that jelly beans are bad for me. Then I realized that the only thing that was holding me to the chair was a seat belt. So I undid it and walked out the front door. If only I realized my intellectual advantage over the jelly beans sooner, this never would’ve happened. The following picture was drawn by my good friend Real. I debated putting this up since it’s not really poorly drawn ha ha. 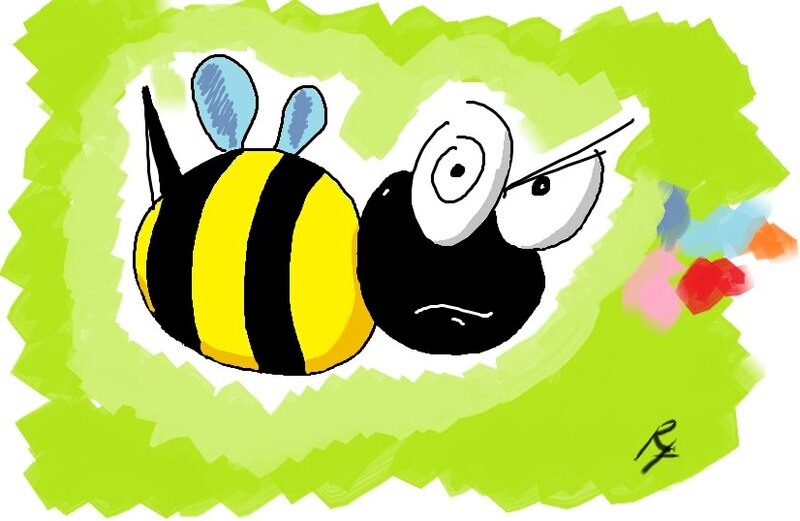 This entry was posted in Bees!, Blog, Blogging and tagged 2012, Art, assault, bees, blog, blogging, pic, picture, short story, situation. Bookmark the permalink. Ha ha, he claims he half-assed it on his drawing tablet. So he claims.